Newly empowered New Hampshire Democrats are preparing to push a clean energy agenda in sharp contrast with Republican Gov. Chris Sununu’s “all-of-the-above” energy vision for the state. At issue will be proposals to expand solar net metering and double the state’s renewable electricity standard to 50 percent by 2040, as well as potential legislation to bolster small hydro, offshore wind and energy efficiency. “We believe these are all things with a new majority can get passed in the House and the Senate,” said Democratic Rep. Peter Somssich, a member of the House Science, Technology and Energy Committee. Whether the proposals have enough support to override vetoes remains to be seen. An override attempt for a net metering bill this year fell 14 votes short in New Hampshire’s 400-member state House. The looming clash follows the release this year of dueling energy plans by Sununu’s administration and state Democrats, who retook both legislative chambers this month for the first time in nearly a decade. New Hampshire’s governor is required to update the state’s 10-year energy strategy every four years. Sununu, re-elected to a second two-year term this month, released his update in April. It emphasized lowering consumer costs and embraced an all-of-the-above approach, including fossil fuels. “Investments and policies should prioritize the most cost-effective energy production and delivery. 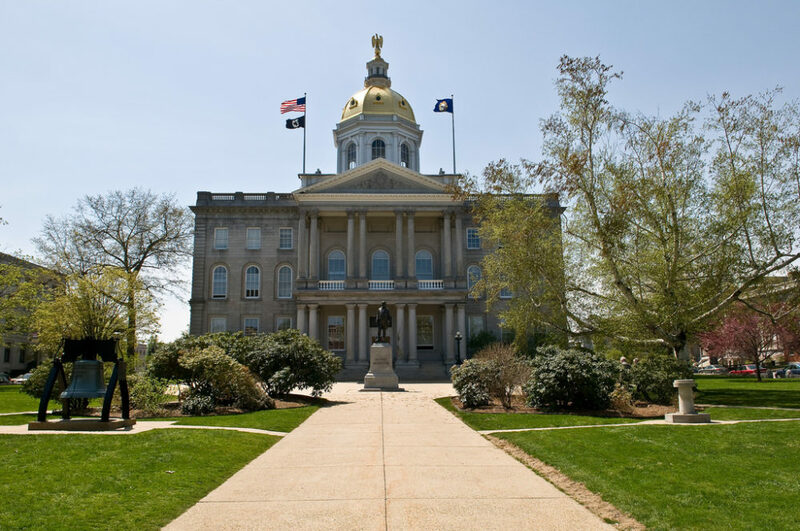 New Hampshire can foster a sustainable and dynamic energy economy by ensuring a favorable regulatory environment, not a regulatory and statutory environment based on favoritism,” the state said. The administration’s priorities are lowering costs (New Hampshire pays the third-highest electricity rates in the contiguous United States), limiting government intervention, and maximizing the use of existing resources. “It didn’t have a lot of forward-thinking of what the state could do,” Somssich said. Believing that renewable energy is being underutilized in the state, the then-minority Democrats proposed an inventory of New Hampshire’s renewable energy resources but were turned down by the Republican majority. Democrats then wrote their own energy report in response. The roadmap, formally known as “A 100% Renewable Energy Strategy for New Hampshire’s Future,” spotlights “up and coming technologies and opportunities” that were neglected in the governor’s report in favor of more conventional energy resources and strategies. “This paper is an attempt to provide an alternative view of NH’s energy future including new and more innovative renewable energy (RE) strategies, that are already beginning to replace traditional energy resources, either due to higher efficiencies or lower prices,” the Democrats’ report says. Somssich served as lead editor of the roadmap, which targets reaching the 100-percent goal by 2040. The document is not a consensus plan but is instead a series of chapters written by experts in fields like solar power, wind energy, biomass, transportation, and energy efficiency, among others. One of the first tests for clean energy advocates will be raising the state’s net metering cap to include large-scale installations, which was vetoed this year by Sununu. Senate Bill 446 would have elevated the net metering cap for projects from 1 megawatt to 5 megawatts. One of the other first proposals will be a renewable portfolio standard of 50 percent by 2040. Not “overly ambitious,” Somssich said, but a start. Current law has a 25 percent renewable portfolio standard by 2025. Other programs outlined in the roadmap include a more active effort to procure offshore wind energy, more incentives for solar energy, greater funding for energy efficiency, and maximizing small hydropower, which already exists in the state. Biomass incentives were passed by the legislature earlier this year when bipartisan majorities overrode a Sununu veto. Solar could play a significant part of the new energy landscape, assuming the net metering expansion advances and the renewable portfolio standard increases, according to Dan Weeks, the ReVision Energy director of market development who wrote the paper’s solar power chapter. While solar has a miniscule 0.7 percent carve-out under the current renewable standard, Weeks said there are “realistic scenarios” to exponentially increase solar power. “The paper looks at what we can do in the short term to get to a modest 5 percent solar power in the next few years to 2025, and then steps to get to one-third in the longer term by 2040 or 2050, where we really need to be as a state to meet what’s needed in this global imperative [against climate change],” he said. The report also acknowledges that reaching 100 percent renewable energy would include partnerships with New Hampshire’s neighbors. This could include maximizing offshore wind potential with Maine, and onshore wind or hydropower with Canada. The legislative session opens on Jan. 3, 2019.